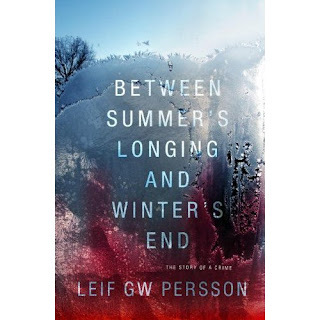 Pantheon Books very kindly sent me an advance copy of Between Summer's Longing and Winter's End, subtitled The Story of a Crime, which is to published in the U.S. in September. The subtitle suggests Sjöwall/Wahlöö, and the novel does share some of the perspective and style of the Martin Beck novels (though not the focus on a single detective unit). The story also shares some common ground with the last two volumes of the Millennium Trilogy, in that one thread of the plot deals with the Swedish secret police, though from a far different perspective, and also in the blatant presentation of misogyny in the culture in general and among the police in particular (and even more blatantly in one of the characters' private life). In fact, a reader can perhaps learn more about life in Sweden from Persson's book (the first installment of a trilogy) than from most other Swedish crime novels, including the Millennium series: the story occurs just before and after Christmas, 1985 (with a bit of explanatory material from earlier decades)—and as with a viewer of the charming first section of Ingmar Bergman's film Fanny and Alexander, a reader will learn a lot about Swedish holiday celebrations, from the 1980s in this case rather than the earlier 20th century, and as in the Bergman film, the holiday season is merely the foreground to a darker tale. Persson's novel combines a bit of Catch-22 with a bit of Le Carre and some suggestion of The Day of the Jackal: his trilogy explores the cultural milieu of an event that Swedes would immediately recognize from the date of the novel's story, the murder of Olaf Palme. But unlike Jackal, we're not presented with a methodical assassination plot, and unlike a Beck novel, we're not shown a coherent if frustrating police procedure. And there's considerable humor (very dark comedy) in the story, the characters, and the sometimes repetitive language (repetition for effect, usually with phrases that Persson shows to be common police language, usually terms they use to refer to themselves). There's also a good deal of carefully handled poetic language, presented in a self-deprecating way, as with the title of this book, its chapter titles, and at least one of its sequels, referring to a poetic paragraph frequently described as ambitious but amateurish. Summer's Longing/Winter's End begins with the apparent suicide of an American journalist who has fallen from the 16th floor of a Stockholm student dormitory, where he has been staying. The several clusters of police who are called to the scene are portrayed in Joseph Wambaugh style, warts and all, each of them given a voice and a distinct point of view and all of them thoroughly embedded in the cynical and insular world of cops. Gradually, a few of the characters become more prominent, particularly Inspector Johansson, who becomes the lead in one of the two major threads of the story. A second thread begins somewhat later, featuring two secret policemen, Berg and Waltin, who have collectively and individually been conspiring to inflate the secret police budget and to create layers of internal and external activity to justify their existence and their budget. The two threads are on different, converging time tracks, with frequent digressions in both (and many digressions from the main plot, in Persson's careful characterizations of the main characters, their private and personal lives, and their sometimes flagrant foibles. There are many twists along the way, sometimes in a realization that a character described by one set of characters is actually someone we have been introduced to in another context (and frequently the realization is a bit ominous). The humor and the overall tome of Summer's Longing/Winter's End is very dark, and not just in the cynicism of the police. The operations of the secret police are sometimes right out of comic opera, but with severe consequences to innocent (and not-so-innocent) citizens, and the regular police force is mostly incompetent to the point of parody (the head of the national police in particular). But Persson knows whereof he speaks: he in fact briefly refers to an event in which he himself took part, as a whistleblower, while employed by the police in the decade before his story, and he is both a lecturer for the National Police Board and a nationally recognized psychological profiler. The operations of regular and secret police are vivid and credible, as well as frequently inept and comic. The pull of the story comes not from a pell-mell rush toward the assassination, since we don't hear anything about it until it happens. Instead, the narrative interest comes from the twists and turns of the two sets of characters as they try to deal with the suicide and its consequences (first of all, its consequences for the cops themselves, and then to the nation). One of the most interesting aspects of the book, for a non-Swede, is the skewed, Swedish point of view in the Cold War. To be seen to have cooperated with the CIA is no less damning than to have cooperated with the Russians, and the secret police have to approach their American cousins through German intermediaries. Swedish politics, as presented here in its '80s version, is fascinating and nuanced, rather than simply presented as a single point of view on the welfare state (pro or con). 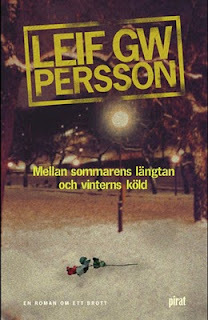 Persson's novel is large, about 550 pages in the translation (which was done by Paul Norlen), but the story never flags. It's plainly not "the next Stieg Larsson," for its aims are more subtle as well as having more cultural weight. Summer's Longing/Winter's End is more chilling, for its realism, than Larsson's novels: thrilling though they may be, and anchored as they are in social criticism, they have a fantasy (almost Nintendo) quality, particularly in the character of Lisbeth Salander. Persson has given us something very different, though no less entertaining (to my mind, anyway): a vibrant tale of conspiracy, espionage, murder, comedy, and abuse of state power, a tale that resonates with our own time and beyond Sweden, while also giving a brightly rendered view of Swedish life and a fascinating set of characters. One word of caution: It's not so much the violence in the story as the misogyny (consciously portrayed rather than simply assumed as given, which is the case in too many thrillers and crime novels) that is shocking, in its pervasive quality and in its particular manifestations. The murky, vindictive, power-hungry world portrayed is a male realm, and as presented it's a regime primed for an overthrow that one might assume (as an outsider) to have begun with the shock to the system to which this novel refers. But if that sounds a bit heavy, I can assure readers that right up to the last page, there are twists that will make you both cringe and smile. Thanks for this review Glenn. This is obviously a book any fan of Scandinavian crime fiction has got to read. Interesting post, and insightful as well. To a Swede, it's fascinating to see the reactions of foreign readers to our native authors; in many cases, I suspect that the translators are doing an amazing job, since some of the writers receiving compliments for their literary talents are among the worst prose stylists in Sweden. This is certainly not true of Leif G.W. Persson, however, although he does tend to repetitiousness and sloppy grammar. Even so, considering his usually excellent plotting, his integration of themes and action, and his almost unique knowledge of crime and police work in Sweden, I would call him one of the two best crime writers alive in Sweden. His only serious competitors are the collaborators Anders Roslund and Börge Hellström. It is sadly very true, though, that you'll find nothing of Stieg Larsson's explicit feminism in Persson's novels, even though he does to some extent try to hide his misogyny by creating an abominalby racist and sexist policeman compared to whose grotesque views everyone else in Persson's novels seem very liberal indeed. Hellström & Roslund generally are less disdaining towards women, but nevertheless let women remain side characters in their novels. The crime authors currently interested in gender issues are, primarily, Katarina Wennstam and Karin Alfredsson, both also among the best Swedish genre writers. John-Henri: Thanks for the insight into the Swedish crime scene. There's a new Roslund-Hellstrom making its way into English this year, but I haven't seen anything about translations of the other writers you mention (here's hoping). I really hated this when I read it a couple of years ago (in German), though that may have something to do with me being a humourless 20-something feminist. But I normally love really long, gritty books, and I couldn't stand this. The characters simply had nothing to say to me. Having checked up on them, it seems that neither Karin Alfredsson nor Katarina Wennstam has had any of their work translated into either English or, considerably more surprising, German. Karin Alfredsson has one novel out in Dutch, but that seems to be it. Which is really depressing, not least since I suspect that those who appreciate Stieg's novels (and who seem to be the primary reason for the sudden flux of translations of Swedish crime fiction) should probably be more interested in these authors than in many of those less feminist, more middle-of-the-road or more cosy crime oriented who are now getting their chance in English. But then Stieg was quite different from most of our crime novelists; if anyone is interested, I try to portray him in my contribution to the collection of essays which will be included in the boxed set of the Millennium novels that MacLehose will issue in Britain in October and Knopf in the US in November. Paul Norlen is not respectfull with people who aré not native English speakers. The same is the editor. This Persson books aré very difficult to understand for people like me . I learnt ESL English. And indeed i read a lot writers like Larsen, Mankell, Grisham, and so on. Please, Translate It again.